When I started EdTech 503 I really had no idea what was in store. I do now. While I feel somewhat overwhelmed with all I have learned I also feel empowered. I certainly need and want to learn more. My project for this course was to design three-hour instruction to help 8th and 9th grade students learn to use Google Docs presentations. It is geared for English Literature students who need to do a class presentation on a poet. They will not only gain content area knowledge but learn valuable 21st Century digital skills that they can apply in various real-world scenarios. It’s been fun but daunting. Here is my 35-page project. There are many supporting documents linked throughout. It has been a grueling process but certainly a learning one. The end is nearing for my semester-long instructional design project, and it is thrilling to see it come together. This week we focus on evaluation. I chose a Subject Matter Expert (SME) to review my materials and offer feedback. The other evaluation types are outside of the scope of this course, but I still had to design what types of questions I would ask in the various evaluation stages. It would be fun to be able to see a project all the way through. ID Project Description: After three hours of classroom instruction, ninth and tenth grade English Literature students will be able to create, publish, and present a multimedia Google Docs presentation on an assigned poet. Do you feel this is a valuable and age-appropriate lesson for 9th and 10th grade English Literature students? How valuable do you feel Google Docs is for this age group to learn? Is the stated learning goal clear and attainable in the time allotted? Do you feel you have an adequate picture of the target learners? Do you feel the needs assessment questions provide helpful insights? Are there any other questions you would ask? Are the Learning Task Analysis flow charts clear and logical? Are there any other Entry Behaviors that you would add? Are the learning objectives clear? Realistic? Measurable? Attainable? Are any confusing? Do you feel like the Part 3b Matrix accurately and appropriately assesses the students? Should anything be added or changed? Do you feel that the PowerPoint presentation supports the instruction adequately? Are there any other materials you would include? If you were to teach similar students this lesson, is there anything you would change? Is the instructor guide clear and easy to understand? The purpose of this evaluation is to try out the instructional materials on a small scale before larger-scale implementation. This evaluation is geared towards a few members of the target audience and is used to fix any problems discovered upfront. This type of evaluation gives the designer an opportunity to fix typos, mistakes, unclear directions and vocabulary, and general ambiguity or confusion. Do you understand the concepts explained in the presentation? Have you learned anything new or did you already know the information presented? Please explain. What is your level of confidence if you were to be tested right now on the information presented? Did you understand what was expected of you during the multimedia quiz? If no, please explain. Are there any graphics, text, or pictures that you did not understand? If yes, please explain. Could you read and understand everything presented to you? What do you think the relevancy, or real-life application, is of the subject matter presented? This stage of evaluation takes into account the answers received during the one-to-one evaluation noted above. It involves a slightly larger, more varied group of students without the designer’s intervention. This evaluation notes the how well the instruction holds its own in a group of varying abilities. Do you have the entry skills listed in the instructional materials? If any are missing, please list. How confident are you that you could begin a Google Doc presentation right now? Please explain. Are there any other skills not discussed that are important to creating and presenting a well-designed presentation? Please explain. Did you feel enough time was given to accomplish what was expected? If not, please explain. Do you feel the information presented is valuable to you personally? Did you enjoy it? Do you feel it is useful? Please explain. What do you think could be improved about this instruction? This stage of the evaluation takes into account the revisions made from the one-on-one and small-group evaluations. It determines the effectiveness of the revisions and looks at any problems that might arise in a real instructional setting. It also uses a large enough group to make a more accurate prediction of the effectiveness of the materials. Can the instruction be used as designed or are revisions needed? Please explain. Did the teacher present the information in a way you could understand? If no, please explain. Do you feel you had enough entry-level skills to accomplish what was expected of you? If not, please explain. Did you have enough time to complete the activities? Did you enjoy the instruction? If not, what could make it more interesting? Do you feel the things you learned have real-life application? Please explain. (For the teacher) How do you feel about the instructional materials? Was it easy to implement as designed or are revisions needed? Did you make any changes or adaptations? Please explain. After three hours of classroom instruction, ninth and tenth grade English Literature students will be introduced to Google Docs presentation and collaboration tools to use for their group presentation on a poet. multimedia Google Docs presentation on an assigned poet. Type of learning: This goal falls under Robert M. Gagné’s description of “intellectual skills” because the students will learn procedural knowledge and then apply that knowledge to a new experience not encountered during instruction (Smith & Ragan, 2005, p. 80). At the end of instruction, students will know how to do something they didn’t know before, in this case create, publish, and present an online presentation using Google Docs presentation. While the instructor may show examples and instructions during class, each student will need to synthesize that information and create his or her own presentation. No two presentations will be alike, either in design or content. Part of the assignment was to link each node, or concept, to a part of the ADDIE process (analysis, design, development, implementation, evaluation). Due to such limited space, and in order to not clutter my original, I chose to create a separate map highlighting these links. Click on either image to open them directly to Google Docs. In short, what I gained, from this assignment is that there are numerous models that an instructional designer may choose from, and he/she must choose the best one to fit the task at hand. It is very easy to become overwhelmed by the complexity of the model itself and lose sight of the overall picture: to create an effective learning experience for the learner. Instructional design is far more complicated and time consuming that I ever imagined, and I look forward to learning more in this course to help break it down into manageable chunks that can yield results. After ninety minutes of classroom instruction, ninth and tenth grade English Literature students will be introduced to Google Docs presentation and collaboration tools to use for their group presentation on a poet. Instructional design experts agree that careful front-end analysis is critical to the overall success of the program being designed. In a lecture on front-end analysis, Dr. Ross Perkins stated in a 2009 lecture, “We do a careful analysis of performance, needs, and job tasks up front so that we are able to describe–as accurately as possible–the goal we must meet. It is said that those who aim at nothing hit it with 100% accuracy. The front-end analysis gives clarity to the needs–or the gap–and the designer then knows exactly which bridge (or bridges) to build.” Our text states that while many may begrudge the time investment that such analysis takes, it actually saves time, cost, and frustration in the end (Smith & Ragan, 2004, p. 42). For technology integration projects, it is important to look at what the problem is and whether technology can help solve the problem. For example, Elliot Saloway from the University of Michegan asked in a 1999 lecture, “How can we use technology in a new way to help kids read and write? When they publish online what they write, they write more and they write better. They need an audience. What are the opportunities of technology to address age-old problems?” I will base my needs assessment upon these principles. My project easily fits within Condition B, as students will learn something new in order to be more proficient in online presentation and collaboration skills (Smith & Ragan, 2004, p. 44). Prior to now, students have been doing group poet presentations using poster board and markers. This year posters have been banned and students are required to use PowerPoint. Students lack the ability to produce professional–or even adequate–presentations. Next year, they will migrate to Google Docs presentation tools, as they are a more practical and feasible fit. Google Docs also works seamlessly with PowerPoint, so students essentially still learn the backbone of PowerPoint or any other presentation software. Online collaboration, an essential 21st-century skill, would eliminate geographic limitations, and an Internet-based platform would serve students who have limited software capability. I plan to develop a survey for the students to assess both instructional needs and the learning environment. Even though the actual students participating will be different that the students polled, the information gathered will still be representative and useful. The school I plan to implement this program in is a charter school with relatively small class sizes. Students come from all over the valley, which makes in-person collaboration difficult. The classroom has a teacher computer with Internet access and is connected to a projector. Some students are low income and do not have personal computers at home and need to use library or school computers. The school uses very little technology but is trying to integrate more. Teachers are encouraged to embrace technology and implement it as much as they can into their curriculum. Hopefully funding will be adjusted in coming years to allow for technological improvements. The culture of the school is rigorous, with high values and moral expectations. Are these students motivated to learn a new technology? Do they see the value in it? Can a connection be made to something they are interested in? Would they like to see more technology implemented in their school and classroom? Do they enjoy working in a group or would they prefer to work alone? Do they see the value in collaboration, even if they don’t enjoy it? Do your friends ever ask you for help with a computer question? Have you completed a PowerPoint presentation that you shared in front of a group of people? If yes, did any slide have photos, video, or sound? Do you have a Google account? If not, do you have any public email account like Yahoo or Hotmail? Have you ever shared a Google doc either publicly or with a friend? Do you have a computer you can use at home? Does it have access to the Internet? If not, do you have a computer you can use, either at a public library, friend’s house, or school? Do you want to learn more about technology than you already know? Do you wish your teacher used technology more in the classroom? If so, how? If not, why? Do you prefer working in a group or by yourself? Why? Why do you think your teacher has this assignment be a group project? Are you interested in poetry? In your poet specifically? If you could learn a new technology to use for your poet presentation, would it make the assignment more interesting? Why or why not? Smith, P. L., & Ragan, T. J. (2004). Instructional design (3rd ed.). Wiley. I have experience in graphic design, so for me the word design is both a verb and a noun. To design something is to conceive, organize, plan, envision, and dream up a product. It involves taking the end goal and abstractly creating a way of getting there. It is the process of actually putting those ideas on paper, so to speak, by whatever means is needed. As a noun, the design refers to how a product looks, its aesthetic appeal, its layout. Products may be anything from a brochure to a website, a business card to a brand identity. While I am not an experienced instructional designer, or even a certified educator, I have unknowingly used ID principles for years. 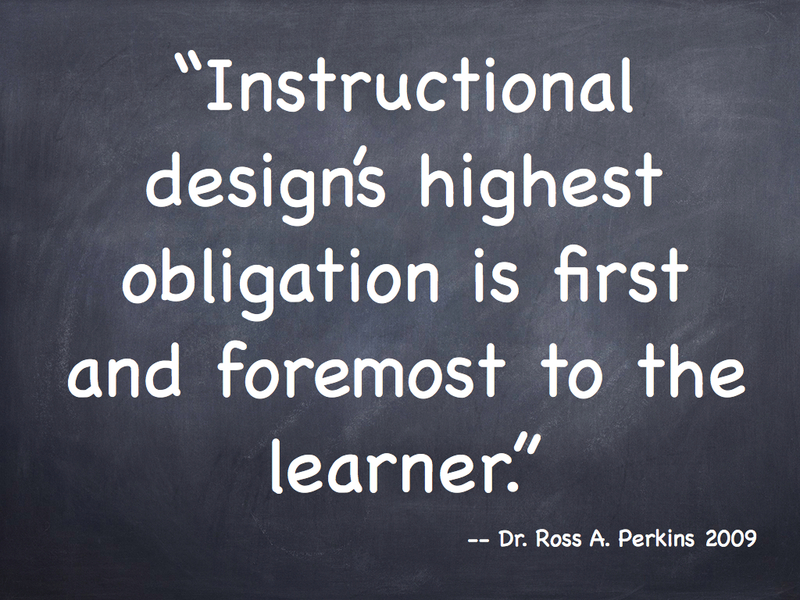 Instructional design applies the above-mentioned principles to instruction. This instruction includes helping students, employees, or consumers reach specific objectives through the completion of the designed instruction. Adding systematic in front enhances its meaning by providing a framework for the design. Hence, systematic instructional design is a model, method, system, or process for achieving optimal results. Most recently I have had the opportunity to work with a program here in Nepal that helps teach English to motivated underprivileged teenagers. I received a grant to travel to outlying areas to expose students and their teachers to various technology tools that can enhance their learning and teaching. This has been an immensely challenging and rewarding responsibility. I was given no guidelines, no requirements to follow — only classes full of exceptionally motivated and willing learners. The majority of the students have never used a computer before in their lives, and I had a wonderful (but daunting) blank slate to start with. Since I am not a trained educator, I have not written many lesson plans or designed instruction to this extent. For me the process involved starting at the end: what did I want these students to gain from my being there? What did I want them to learn, to take away from our short time together? Since I only had three hours with each class, and was not able to provide ongoing follow-up and support, I had to design an experience that would be useful and worthwhile for them in the short time we had together. I have recorded my experiences here on my Learning Log, and have learned a lot from my mistakes along the way. As a result, each new class is better than the last. I have redesigned as I’ve gone along, often starting over completely, and have factored in what has and has not went well. I completely agree that “when applying instructional systems design to an instructional technology initiative in a developing country, it is important to keep in mind that the design process never takes place in a vacuum” (Arias & Clark, 1970, p. 52). There are so many other factors to consider, such as access, electricity, cultural norms, infrastructure, and so on. As such, instructional designers need to be “appropriately prepared to work with the unique challenges found in those environments” (Arias & Clark, 1970, p. 53). I have a unique opportunity to work with these students, and I hope the ID principles I learn in this course will support me in my effort. Without being an expert yet in either field, I can clearly see the relationship between Instructional Design and Educational Technology. While it’s not a perfect analogy, I see Instructional Design as a toolbox and Educational Technology as one of those tools. Robert A. Reiser states, “Professionals in the field of instructional design and technology often use systematic instructional design procedures and employ a variety of instructional media to accomplish their goals” (2001, p. 57). Educational Technology is generally the application of technology, the instructional media Reiser referred to, in a K-12 or higher education classroom setting. Instructional Design reaches further than educational environments. It is used in virtually every line of work from corporations to governments. I like learning both Instructional Design and Educational Technology, and I feel that together they are powerful tools that will build powerful outcomes. After ninety minutes of classroom instruction, ninth and tenth grade English Literature students will be introduced to five online multimedia presentation tools and choose one to use for their group presentation on a poet. Arias, S., & Clark, K. A. (1970). Instructional technologies in developing countries: A contextual analysis approach. TechTrends: Linking Research & Practice to Improve Learning, 48(4), 52-55.